At the heart of Shaftesbury, famous for Gold Hill, is St Denis Lodge a small, independently owned care home on a mission. Calling on Lolly to help share this mission – to change the community’s perception of care homes and tackle the reluctance of elderly homeowners to downsize and lose their sense of independence – and inspire elder generations within the local community, we set about helping to reassure homeowners that selling up isn’t giving up. 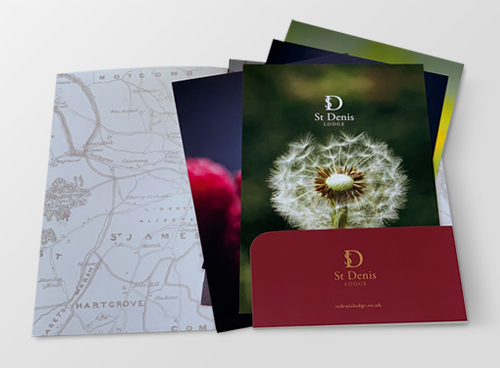 We started by simply refreshing their promotional print materials using inviting imagery and inspiring descriptions to showcase what life at St Denis Lodge is – a ‘home from home’ experience with a varied daily cocktail of events and activities, fresh, homecooked local food, and good company, friends old and new. These messages along with their welcoming persona, industry expertise and seasonal calendar events have been shared to local publications through a number of press releases to continually inspire those thinking about downsizing or who are feeling socially isolated to take the leap and just do it!